It’ll be worth it though, I swear. On that afternoon, I was looking for something to do, to procrastinate from what I was supposed to be doing – working on my next cookbook. I just wasn’t “feeling it” that afternoon, and I really do work better when I can get away from a project for a bit. “Weepy Mom Moment: My almost 15 yo Aspie, who was picked on in elementary school and used to come home crying because she had no friends, and who, according to one teacher, used to play with a tree at recess, is in the final voting round to be homecoming Princess for her grade! My ears (eyes?) Perked up at this point. A CHALLENGE! I could HELP. She thought something was impossible, and I could prove her wrong! 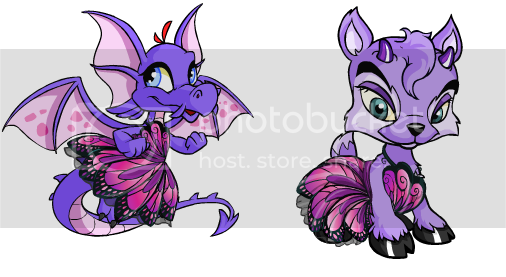 Sounded right up my alley, so I probed for some more details on the dress – which was a Neopets gown (Click here to view the inspiration dress, from a post on the Neopets website) – saw that it was something I was perfectly capable of making, and gave Heidi a call. Now, Heidi and I have had a … complicated… relationship over the short time I’ve known her – and I’ve only ever known her online. We don’t see eye to eye on pretty much anything with regards to politics or religion, and that has led to things like arguments, de-friendings on Facebook … I had her blocked for a while… Yeah. I could do something nice for both of them! So, I called Heidi up. Given our somewhat tumultuous history, I’m still surprised that she replied to my opening: “Heidi, how much do you trust me?” in such a positive way. When she affirmed that yes, she trusts me completely.. I told her that I could absolutely make that gown, even on the ridiculous timeline we were looking at. It was a Thursday evening, and her event was the following Saturday. In Florida…. and I had 2 days in between where I was solidly booked and had no time for sewing! So we agreed – she would pay for the fabrics, I would make the gown as fast as I could, ship it overnight, and they would get any needed alterations on their end. That evening, I instructed her on how to take the measurements I would need, over the phone. It was amusing to hear it all go down – us Aspies aren’t necessarily the best about being touched, and I could hear that Abby was feeling pretty awkward about the measurements. I immediately set about my business – there was a lot to be done in a short amount of time. Also, I had not made a gown in years, AND I’d be doing it without opportunity for a fitting. Heidi had never taken measurements before, AND there was some confusion as to the accuracy of two of the measurements… oh, adventure! As I was plotting the logistics, Heidi was overwhelmed with emotion at the whole thing. She told us of how Abby had struggled to make friends in school, and how it had broken Heidi’s heart when, at a friend’s birthday party, Abby ran to their bedroom, threw herself down on the bed sobbing, and said, “Everybody treats me like a stray dog”. When Heidi explained how cool people like Einstein and Mozart probably had Asperger’s, too, and it was part of why she was so smart, Abby cried “I wish I had friends instead of being smart”. That broke MY heart. I could relate to all of it. Oh, how on earth do I compile everything that happened into one blog entry, and in a coherent manner? What happened – starting almost immediately after Heidi’s initial post – is something that this group of friends has come to refer to as a “LadyNerd Tsunami”. A few people wanted to chip in to the fabric fund, asking for my Paypal. Heidi and I agreed, they’d send to me, and I’d deduct it from the total that Heidi would reimburse. … except the entire ~$200 fabric bill was completely paid for within 24 hours. … and then, the shipping was covered very shortly after announcing that the fabric was covered. … and then more money was sent to Heidi, completely covering the cost for a huge crinoline, shoes, and earrings. My friend Sarah, of Sarah Elizabeth Artistry loaned me a dressform to use, as I had long ago sold mine. My friend Lauren, of Style in Abundance custom made a gorgeous filigree pendant for the dress, sending it along with a note that made all of us cry. My friend Laura shipped the black satin opera gloves that she had worn to her own prom, as a gift. As I’d never shipped a gown before, I called up my friend Felicia at The Chapel of Love in the Mall of America, asking for advice on boxes, packing, etc. She generously offered to box it for me, free of charge – she wouldn’t even take reimbursement for materials. THEN, she was so excited at the whole story of what was happening, she donated a gorgeous sparkly crystal headband for Abby! All told, Abby had 24 Fairy Godmothers contributing – from as far away as Finland – and most of them were on board before I’d even purchased the fabric! Energized by what was going on, I went and picked up the fabric – blue, green, and black, per Abby’s request. I went home, flipped on Pandora radio, and was pleasantly greeted by 2 Unlimited’s “Get Ready for This”… what a great way to kick off drafting my first gown pattern in the better part of a decade! I had only 4 days available to make the gown, so progress went quickly. Every time I finished a major step, I took a short break to post an update photo to Facebook. On her end, Heidi would post comments and photos about how excited her daughter Abby was. A lot of us were living vicariously through what was going on, with several commenting on how they hadn’t gone to prom, etc. We were all able to see a little bit of ourselves in Abby, and there were SO many tears of happiness along the way! Heidi with the donated crinoline Heidi kept updating her Facebook profile photo to reflect current updates – a new step in the dress, the photo Lauren had sent of the pendant, the arrival of the crinoline – and had set her “cover” photo to the picture of the fabric / sketch of the dress that I had sent from the fabric store. It was SO much fun to see how excited she was over the whole thing! I kept all of the updates positive, even though I was experiencing some MAJOR drama during the making of this dress. This post will be the first that anyone hears of what was going on, hahah! First off, there was serger drama. Our needle plate is broken, with a snapped off piece being held on by a quickie epoxy job. Any weird noise – click, crunch, whatever – had my heart stop. The replacement piece should have been here in tons of time for this, but during the course of sewing, we found that it had been discontinued. I was holding my breath the entire time, hoping that my Macguyvered machine would hold up. Then, the timing went off on my sewing machine. Awesome. I was so dreading the possibility of having to post an emergency Facebook status, looking for a loaner machine ASAP. In the end, though, it all held up! While the strength/endurance of my sewing machines were questionable, the same couldn’t be said for my ego. The comments that were flying – literally, HUNDREDS – basically had me convinced that I’m the Tony Stark of fabric. So many wonderful things being said, I spent a good portion of the past week blushing like mad. Much peer pressure to get on Project Runway, even though I really hate sewing, and have NO desire to ever do so for a living – EVER! – again! Oh, and according to one of my former cake clients, I am a “Goddess of Creation”! Sounds like a bit of an upgrade from “Evil Cake Overlord”, eh? Awesome! I had NO idea that my little offer would turn into such a big thing, but I am seriously thankful for all of the kind words! The gown was finished on time, Wednesday before noon. My husband came home from work to take some professional photos, and then I was off to the Mall of America to have the gown boxed. I just want to say, I absolutely adore Felicia Glass-Wilcox of The Chapel of Love. Definitely one of my favorite people in the wedding industry – super friendly, nice, and easy to work with. I loved seeing how excited she was to get involved, and really appreciated her expertise in boxing my gown. I had a fun time! Felicia then looked up shipping rates at UPS and FedEx, and advised me that – in her experience – USPS would be cheaper… so she looked THAT up for me, too. Yep – about half the price. Score! Learning about differences – in our cultures, the way we’ve been raised, linguistic quirks, etc – has always been an interesting thing to explore in our marriage. We’re always learning new things! When it comes to birthdays, we come from VERY different backgrounds. Though my mother struggled to pay the bills, as a single mother with no support, birthdays were important in our family. What she lacked in budget, she made up for in creativity – and she went all out with it. I remember making “grass skirts”, leis, etc for a Hawaiian luau party – she even used acrylic paints to design a wall covering. I think it may have been a sheet or something, painted with big, tropical leaves. One year, she made me an elaborate little 3 tiered birthday cake, covered in lattice work and a TON of meticulously piped flowers. My husband, however, was raised in a religion that prohibits a lot of the celebrations that are pretty commonplace for most – including birthday parties. That whole experience left him a dyed-in-the-wool Atheist… but more importantly, it left him an absolutely blank slate, as far as birthday parties go. Coming from my background, I was horrified at the idea of him missing out on all of those experiences and memories, growing up. I mean, I don’t have many good memories from my childhood, so those birthday party memories are definitely bright spots, for me. So, shortly after we met, I set about to rectify the situation. I would work to give him all of the typical birthday experiences that many of us would see as… typical. To date, he’s had a surprise party, a roller skating party (WITH bad, roller-rink pizza! ), a sleepover with bad horror movies, and even a party at Chuck E Cheese. Yes, our group of adults looked horribly out of place, but fun was had by all! Oh, and goodie bags. Yes. I make cheesey, sugar-laden goodie bags for his birthday parties. Why don’t more adult birthdays include goodie bags, by the way? Everything is better hopped up on sugar. Pixi Stix all around, baby! This year, it was time for him to have the bowling alley birthday party. Now, one of my absolute favorite birthday cakes of my childhood wasn’t even a cake! It was this colorful, fruity, “dessert pizza” concoction. I was a bit of a weird kid, in that I preferred fruit and sherbet over cake and ice cream, so it REALLY stood out to me. It was just so much fun, I decided to make one for his birthday this year. It went over so well, I’m sharing the recipe with you! Spray a metal or tinfoil pizza pan with nonstick spray, set aside. In a glass bowl (microwave) or large pot (stove top), melt butter and marshmallows, stirring until completely melted and well combined. Add cereal, stir until well coated. Press mixture into bottom of pizza pan to form a “pizza crust” – keep the middle relatively even, and build up a bit of a “crust” around the outside. Cool until set. Pavlovas are my absolute favorite dessert of all time! They’re basically a type of large meringue – one which is crispy on the outside, and like a marshmallow on the inside! – heaped with whipped cream, then topped with fruit. Does it get any better? No. No, it doesn’t! Nice light texture, and a wonderful way to enjoy fresh fruit. Perfect summer dessert for entertaining, and this is a really easy recipe for anyone. A quick head’s up though – if your meringue is not cracked by the time you remove it from the oven, it will likely crack at some other point, and will almost certainly crack when you start garnishing. Don’t worry! Totally normal, no one will notice or care! Get ready: Preheat your oven to 350 degrees. Remove eggs from fridge and allow to warm to room temp (about 5 minutes). Line a baking (cookie) sheet with parchment paper, and set aside. Fit your electric mixer with the whisk attachment. In your mixer bowl, beat egg whites together with salt until glossy peaks form. Slowly add in the sugar, and continue whipping until stiff peaks form. Turn off mixer, remove bowl. Sprinkle vanilla**, vinegar, and cornstarch over meringue, gently fold in till combined. Heap meringue onto the center of your baking sheet. Use a spatula to spread the meringue out to approximately an 8-9″ circle. I like to have my meringue a fairly even depth throughout – some like a mound, some like it to be a little concave. If you want to get really fancy, put the meringue into a pastry bag and pipe it out as a mass of swirls that form your 8″ circle! It’s really up to you! Put the baking sheet into your oven, and turn the temperature down to 250 degrees. Bake for 1 hour and 20 minutes. Once your timer goes off, turn the oven off and let the meringue cool in the oven for several hours. The baking of the meringue can be done the day before, if needed! Mound the whipped cream on your pavlova, and top with fresh fruits. Serve immediately! * Super fine / castor sugar is granulated sugar with a much finer grain size than regular granulated sugar. It is NOT powdered / icing sugar! Super fine sugar is usually sold near the sugar in the baking aisle, in small boxes – sometimes resembling milk cartons. If you aren’t able to find actual super fine sugar, you can process regular granulated sugar in your food processor until fine. Measure AFTER you process! – Rum flavoring in the meringue and whipped cream. Top with sliced bananas, mango, and toasted coconut. – Almond flavoring in meringue and whipped cream. Top with strawberries, raspberries, and blueberries, garnishing with fresh mint leaves if available. – Substitute half of the sugar with light brown sugar. Use rum flavoring in the meringue & whipped cream. Top with cooled bananas foster and pecans! – 1/4 cup cocoa in the meringue, 2-3 tablespoons cocoa in the whipped cream, top with raspberries (Sometimes marinated in Chambord! ), drizzle with chocolate sauce. Great for Valentine’s Day! One caveat, however: You cannot use oil-based flavoring in your pavlova meringue. Its presence will cause the meringue structure to break down.